Nevada State Recycle is a socially and environmentally conscious recycling company. Our company is committed to providing convenient methods for recycling by promoting a one stop business philosophy. At Nevada State Recycle, we offer a FREE drop-off service at our designated drop-off center in Las Vegas. Bring any of your electronic items to any to our locations today and we will take care of the rest. All items dropped-off will be recycled according to state rules and regulatory guidelines. There is no minimum weight or quantity requirement for drop-off loads. Pick-up services are available to all customers, businesses or households for a small fee. Please refer to our acceptable recyclable products list. We even issue Recycling Certificates approved by EPA standards to customers upon request. All CRT TV's will be charged a $50 pick-up fee for the first TV, and $20 for each additional. All rear-projection TV's will be charged a $50 pick-up fee plus a $20 recycling fee. All appliances (refrigerators, washers, dryers etc.) will be charged a $50 pick-up fee for the first appliance, and $10 for each additional. Refer to our online pick-up request page: Request a Pick-Up! FREE quick and efficient removal of all of your electronics, metals and e-waste. We will come to your storage unit and remove any and all items and e-waste that are listed on our acceptable recyclable products list. Regardless of your industry, data security is a concern to all. Nevada State Recycle offers a wide-range of data security options. We can provide destruction services of data and memory equipment such as hard-drives, computers, servers and internal hardware. Certificates Of Destruction and data security guaranteed can be provided upon request. Please call for a quote for destruction services! Promote an environmentally, green & friendly culture! Waste Bins for recycle electronics are available for all businesses including but not limited to corporate offices, shopping malls, retail stores, school districts, and property management buildings. Provides the convenience of dropping electronic waste in one central location. 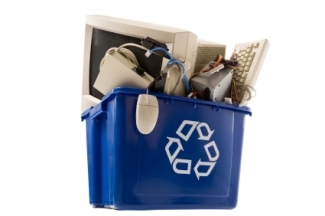 Eliminate improper e-waste accumulation and landfill disposal. Promotes a green and environmental friendly corporate culture.